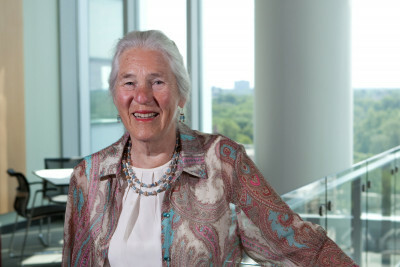 Memorial Sloan Kettering President and CEO Craig Thompson reflects on the life and career of cancer research pioneer Janet Rowley. I learned with great sadness earlier this week of the death of Janet Davison Rowley. A few years ago, the New York Times called Dr. Rowley “the matriarch of modern cancer genetics,” and I find that designation to be a fitting one. Dr. Rowley earned her medical degree in 1948 at a time when few women pursued careers in medicine and even fewer dedicated themselves to biological research. After working first as a clinician in the pediatric setting, including treating children with Down syndrome, she turned her focus in the early 1960s toward the study of chromosomes and the then-nascent field of cytogenetics. In 1972 she discovered the first translocation — exchange of DNA between chromosomes — in patients with acute myeloblastic leukemia. Subsequently, she found that the Philadelphia chromosome, which had been first reported in 1960 by Peter Nowell and David Hungerford and was implicated in chronic myeloid leukemia, also resulted from a translocation. These findings provided early key evidence that cancer was a genetic disorder and set the stage for the remarkable advances we’ve seen in our understanding of cancer genetics, especially over the past decade. Janet’s discovery that the translocation of a segment of chromosome 22 to chromosome 9 resulted in the relocation of important genes that regulated cell growth and cell division helped lead to the development of imatinib (Gleevec®), one of the first cancer drugs to directly target a molecular defect inside cancer cells. Imatinib works by blocking the abnormal protein created by the translocation. The drug turned what was once a fatal disease into a condition that is often treatable. Imatinib has since been found to be effective against several other types of cancer, and it paved the way for many of the other targeted therapies we are able to offer to cancer patients today. Dr. Rowley was the recipient of dozens of major awards, not the least of which was Memorial Sloan Kettering’s own Katherine Berkan Judd Award in 1989. Among her most prestigious honors were the Albert Lasker Clinical Medicine Research Prize, the National Medal of Science, the Benjamin Franklin Medal for Distinguished Achievement in the Sciences, the Presidential Medal of Freedom, and the Japan Prize. Earlier this year she was still collecting accolades as a recipient of the Albany Prize for her role in the development of imatinib. I speak on behalf of the entire Memorial Sloan Kettering community in expressing my deepest condolences to Janet’s family and friends, as well as her colleagues at the University of Chicago. Her work has made immeasurable contributions toward our understanding of cancer genetics and in doing so has also helped countless cancer patients. We are grateful for all that she accomplished, and she will be greatly missed.